Cozy living room that is perfect for family time and snuggling up by the fireplace. Front entrance sitting room is warm, welcoming, and is a good example of the country chic decor throughout the entire home. No children's table needed the dining room table is big enough for the whole family! King size bed that will have you snug as a bug on those chillier nights. Master bedroom with a large king sized bed. Seating on side of home to read a book and just relax. Entrance with a welcoming feeling. Our home use to be a diary farm in the late 1920s and has kept its country charm ever since. Front yard to enjoy nature. Meditation room for those who want to find their inner zen. This porch area is great for enjoying your morning coffee/tea, or to catch up on a good book. Upstairs bathroom that displays the country decor shown throughout the home. Dairy butter room with actual artifacts from when the dairy farm was running. 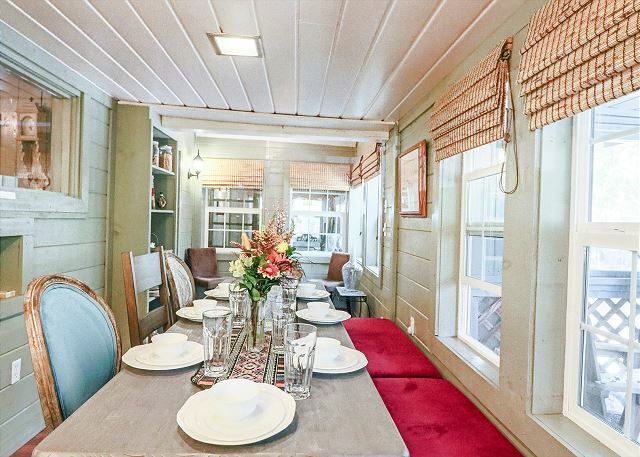 This country kitchen is perfect for those who want to embrace their inner chef. Welcome to Idyllwild Dairy Manor! This one-of-a-kind property is packed with style, elegance and history. 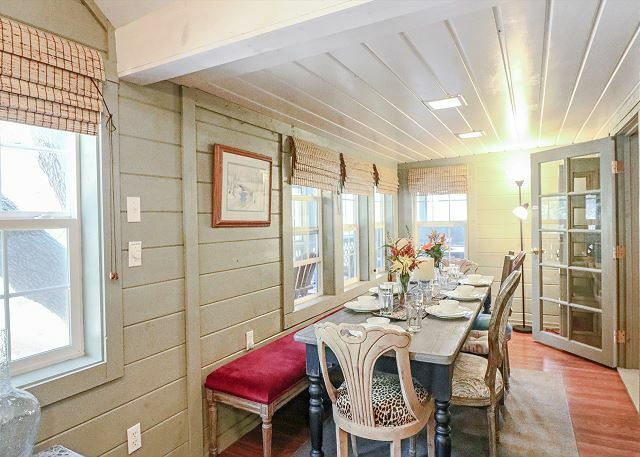 You will fall in love with the home’s country charm. The property is located on a historical dairy farm that was built in the late 1920s. The home has been thoughtfully decorated to both give a luxurious and appealing ambiance but at the same time maintain the integrity and history of the property as a dairy farm. 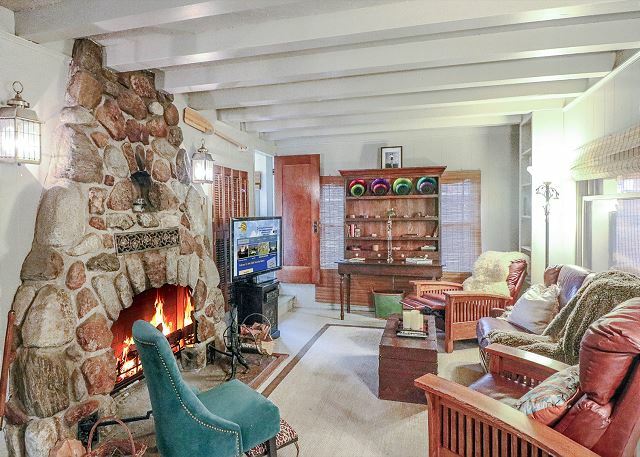 The living room has a beautiful large fireplace that is perfect to snuggle up near and spend some quality time. 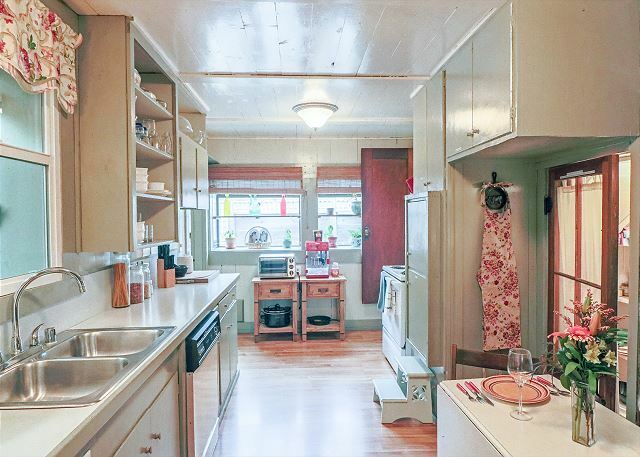 The kitchen is very large and stocked with all the essentials one could need as well as novelty items such as a popcorn maker. The dining table can seat up to 10 people, and makes a wonderful backdrop to a memorable family dinner. When staying at the manor there are 3 bedrooms and 2 bathrooms. The master has a king sized bed, the 2nd bedroom has a queen and the third bedroom has two twin beds. The home is very large and has many cool rooms to explore and utilize, such as a meditation room, a sun room, a closed-in patio deck, and more. The property is only a few blocks from town. Why take the car when you can take a nice scenic 5-7 minute walk amongst the tall pines. The grounds of the property are very large and there are seating areas and gardens around the home. Idyllwild Dairy Manor is a one-of-a-kind home with all the charm, beauty and luxury one could possibly want in a vacation. Book today and make memories with the people who matter most! Weekend rate Friday/Saturday is $295.00 p/night. Weekday rate Sunday thru Thursday is $250.00 p/night. Winter Holiday rate $350.00 p/night (Thanksgiving, Christmas & New Year's Eve), with a 4 night minimum. Holiday rate $325.00 p/night, a 3 day minimum may be required. Call us for our weekly/monthly specials. Pets are welcome. Pet fee will apply. Linen/Prep fee $120.00. The Dairy Farm was so lovey and well appointed. The uniqueness and charm added so much to our stay. We rented the Dairy Manor and the stand alone cottage for a photo shoot. The team at New Spirit was very accommodating to all of our needs for the shoot and our stay. Would highly consider for another trip - business or personal!